As a messy cook myself, I always wear an apron. I usually wear a full apron, neck to knees, again, I mentioned I was a messy cook. When I saw all these fantastic aprons hanging I wondered how many meals they had they prepared in their lifetime? Who made them? Who were the women that wore them? How many noses had they wiped and how many tears had they dried? Some with pockets and some with lace. Some well worn and some looked new. Oh the stories they could tell and all the secrets that they keep. Wonderfully eye catching. What a great find. I missed your dailies!!! You have such great commentary. And seeing wash hanging out brings back memories of my childhood -- remember the fresh air scent? Great photo only accentuated by your commentary! 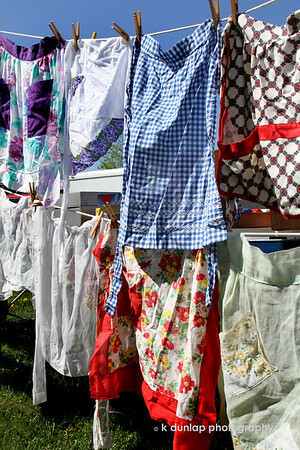 Aprons and hanging on the line to dry really reaches into the memory bank. Oh what the young ones have no clue about.